Are you a healthcare provider that is currently considering organizing your clinical service offerings around formally structured service lines? Have you already attempted to implement service lines in one area and come across some unforeseen difficulties, turf wars, and clinician pushback? Have you established a service line structure across your enterprise and are wondering how to grow particular lines to increase profitability or lower costs? 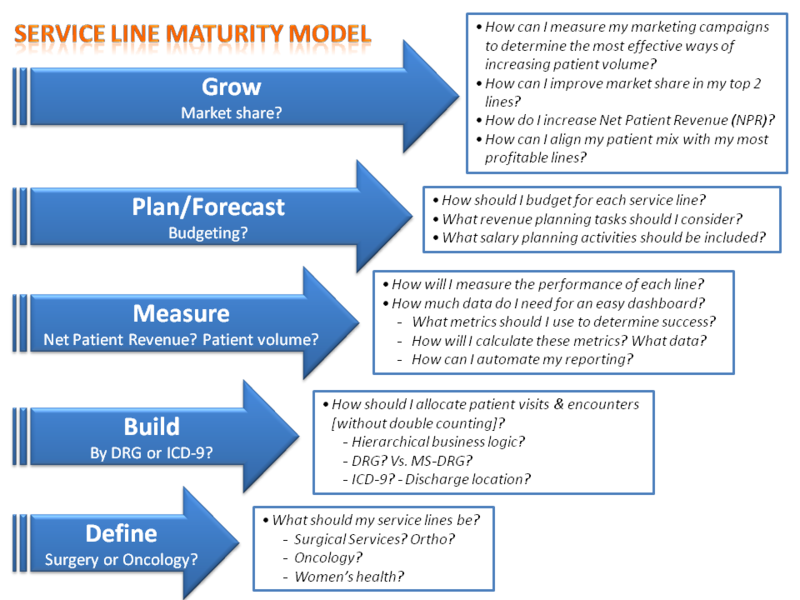 These scenarios depict the various states of maturity that healthcare providers find themselves in as they struggle to define, implement, build, measure, plan/forecast and grow service lines. Regardless of where you sit in this Maturity Model, there are obstacles impeding your progress and growth. There is no easy way to implement service lines. There are too many egos involved, too many possible hurt feelings, and not enough resources to go around. Why? Because when it comes down to it, you will be favoring one set of surgeons, or doctors, or nurses in a department and therefore giving them more attention, time, money, and other limited resources. And you’re doing this because you’ve determined that partnering with certain specialties or surgical teams or departments will reap greater financial reward, improve clinical outcomes and position your organization for greater potential growth. Hospitals are finally starting to realize that running healthcare like a business makes good cents. And aligning your organization around a defined set of service lines is exactly like maintaining a diversified portfolio of investments – some investments will be more profitable than others; some will have higher risk; some will receive greater scrutiny and public attention; and some will undoubtedly loose you money. Regardless of the way you chose to do it, though, service lines are a great strategy for healthcare organizations to focus on what they’re best at, align their clinical services with that of their target markets, realize the best return on their marketing dollars, and position their institutions for the greatest possible growth both financially and clinically. In these tough economic times with rising healthcare costs and dwindling reimbursements, along with looming regulatory changes mandating bundled payments, service lines offer a framework for providers to align their clinical, financial, and operational objectives with dynamic markets and an aging population. Over the past two years we have worked with institutions across the country, ranging from academic medical centers to integrated delivery networks, comprehensive cancer centers and multi-hospital organizations helping them progress along the Service Line Maturity Model. Similar obstacles continue to pop up including clinician buy-in and investments, incentives for progress and adaptation, cultural change management, and how to overcome the inherent data management challenges associated with defining, monitoring and measuring success and growth. In addition, there continue to be more technical challenges like, “how do I allocate individual patient visits to each service line?” We helped create business logic with hierarchies that include data points like DRG (and MS-DRG), ICD-9 diagnosis codes, discharge service, and others that help clearly define which patients go where. We’ve established goals for key performance indicators like Net Patient Revenue (NPR), Units of Service (UOS)/Rates, and patient/payer mix. In addition, there are frequently discussions about employee planning and how to determine where critical skill set deficiencies exists in the next 2, 5, and 10 years as the clinical workforce ages and retires. If it’s at the enterprise level dealing with strategic goals, or the department level dealing with tactical goals, a successful service line model requires a comprehensive, integrated, and coordinated mission from all levels of an organization. The worst thing you can do is try and go at this alone or in a silo, you’ll only soon find out not everyone agrees this is the best path forward…especially if you’re stepping on their turf. This entry was posted in Healthcare and tagged clinical data, Healthcare, healthcare bi, healthcare business intelligence, healthcare daa, healthcare data, healthcare provider, service lines. Bookmark the permalink.